Profitable Downtown Sacramento Restaurant! High Foot Traffic Location! Downtown Sacramento Deli and Grill close to Major office spaces, Capitol and Convention center! This restaurant has a large Dining area with huge! walk through counter/order line. This Restaurant Concept possibilities are endless from casual to upscale or Keep the current menu.... it's profitable and well liked. There is several upscale restaurants just steps away and plenty of parking in nearby garages. This is a very safe area as well with major hotel security in same building. There is a shaded 400sqf Patio for additional seating and ambience. There are two bathrooms and a good size private office. Also included is a large 375 sqf storage catering/prep room that has prep tables and freezers in it now, but has its own possibilities with creative ownership. Current Menu: Breakfast, Deli sandwiches, hamburgers, Panini's, Salads, Soups and more. Minimal staff needed with current concept, helps keep labor costs down. 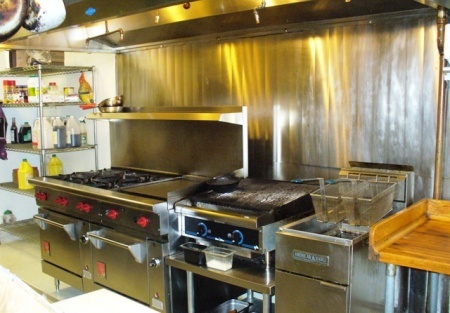 Kitchen : Wolf range with 2 convection ovens, 6 burners, 24" flat top, Fryer, Char broiler, walk in Cooler, freezers and much more, Everything you need to run a full restaurant and plenty of room for catering. Lease: Reasonable Rent for a downtown Location at $5,759 for 2,851 sqf, plus nnn $1,307. They have plenty of options in lease and lanlord takes care of the area well! Reason for Selling: Owners need to attend to family members needs. This is a well priced turn key operation. Owners will consider some financing to qualified buyer! A Paramount Restaurant Brokers, inc. Listing.